The author of this book, Tami Boehmer is a Stage 4 breast cancer patient. She wrote: I fought off depression and was haunted by the sinking feeling I was going to die. I felt useless and empty. I was searching for meaning in life. On one of my daily morning walks, an idea popped into my mind. “Why not write a book about other advanced stage cancer patients and how they beat the odds?” I thought it would not only be therapeutic for me, but it could help others. I knew from experience that people needed to hear success stories and the importance of hope in fighting cancer. These miracle survivors taught me cancer doesn’t have to be a death sentence. From them, I learned cancer was the beginning of a new way of life filled with appreciation, hope and discovering my potential. Refusing to buy into statistics and the death sentences. Never giving up, no matter what. Relying on support from family, loved ones or support groups. Choosing to look on the bright side and see the gifts that cancer brings. Giving back and making a difference in other people’s lives. Having a strong faith in God or something larger than themselves. Being proactive participants in their health care. Viewing their lives as transformed by their experience. 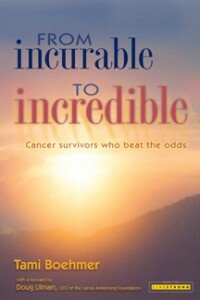 There are 27 chapters written by 27 outstanding cancer survivors. Let me quote what some of these champions said. I’ve had two rare diseases. Now to be alive and well – it’s a miracle. From the fall of 2001 to December 2006, I’ve had seven surgeries. I have no gallbladder, spleen, omentum, or left eye, but thanks to the man upstairs taking good care of me, I’m here. I believe it’s for a reason. My faith had a lot to do with my survival. I’ve read we all have gifts and we should use them. Mine is compassion, and until now, I didn’t realize I had it. If this building burned down, I could tell you what you’d need to rebuild it. That’s not a gift, it’s skill. Compassion is a gift. I know what it’s like to lie there wondering if you’re going to live or die. Some of the patients I see don’t get any visitors because they’re from out of town. I can be there and let them know someone cares and understands. I feel there was a reason I had lung cancer. Why did I get it, and why did I survive? I think it was so I could give back to society, help people with this disease, speak up and give them encouragement that they, too, can survive. I wake up in the morning and thank God for the day because every day is a blessing. And when I crawl in bed at night, I thank God for the day, no matter how good or bad it was. Cancer has blessed me to be able to do that. If I have inspired others and given them hope, I know my work is well worth it. This experience has changed forever who I am as a person. It makes the little things seem nonexistent. I know what the big obstacles can be; I’ve already climbed that mountain. I am thankful for each and every day. It wasn’t a matter of IF I was going to survive, it was WHEN I survived. And I knew when this was all over; I wanted to do something to help others affected by cancer. By sharing my story, I can say, “Cancer rearranges your priorities in life and puts things in perspective. I tell them how my cancer has never left me. It may have left my body, but it is always in the back of my head. I have chosen to embrace how the experience has changed me for the better, not what it has taken from me. I started feeling grateful for all the good in my life, including my cancer. In that moment, cancer was the right thing for me to be experiencing because it was part of my waking-up process. I was always trying to control everything. It’s incredibly fatiguing to try to control everything in life when in actuality there’s no control. I realised that while I couldn’t control events in my life, I COULD control my response to them. I could learn from it. I used to always have to be right as opposed to letting my spirit guide the ship. I’m not about being right anymore. People think if you surrender to cancer, it will kill you. But that’s not true. They gave us the choice of standard treatment protocol or an experimental one called the Denver Protocol. We chose the latter. To kill the cancer, you have to prune the tree severely without killing it. We asked the doctor what happened to the other kids in the Denver Protocol. She told us ninety-seven had died, two were close to death, and one made it – that was me. I believe I survived because I fought the disease and stayed positive. I understand now that even in grief and sorrow, God works through all our experiences. One of the things I like least about the medical establishment is when a doctor says, “You have two months to live.” They can’t know absolutely, so don’t believe it. Don’t accept it. Spit on it! Stomp on it! They’re wrong. People used to call me and say, “I’m dying from cancer.” I’d say, “Wait, let’s have an attitude adjustment. You’re LIVING with cancer. Get that dying stuff out of your mind. It is all how you look at it, not what is happening. The big thing for me is to be able to help people in a meaningful way. I have that joy in my life ever day. Making a difference in people’s lives; that’s what keeps me going. It’s an incredible feeling. You can talk to friends or relatives all you want, but they aren’t in the same orbit. You need to talk with others who are going through it. I saw other people going through this, and found there was something I could learn from each one of them. We need to make a difference in the world. We understand now material things aren’t what we need in life. Connections to other people, empathy, and helping others are what’s important. My advice to people who are going through a similar diagnosis is to never let a doctor take your hope away. Cancer has taught me to live one day at a time. If you wake up happy and go to bed happy knowing you’re helping people, you can be grateful for that. There is no question in my mind I had cancer because I was supposed to figure out a way to make the system better. I think people go through certain things because there’s a larger purpose. They see a gap and get passionate about filling it. I’m one of those guys. That’s what gets us stoked and motivated: knowing we’re making a difference. Thankfully, I found another doctor who disagreed. I was successfully treated with legs intact. The doctors told me they could save my legs, but the chemo would be very harsh. At times it felt as though they would figure out how much chemo would kill me, dump a little bit out, and give me the rest. In fact, the chemo almost killed me twice. Once you’ve had cancer, everything else seems easy. It’s amazing how when you change the way you look at the world, the world changes. You just have to have faith it’s going to work out, and it always does. Mother (Deirdre Carey): We believed in miracles and the power of prayer and held on to that one glimmer of hope. If his chances were one in a million, our thought was, there’s no reason he can’t be the one. We had our faith, which absolutely carried us through. Attitude is the driving force of every action you take. You can live in a world of doom and gloom or you can rise above it. From my experience and from talking with other cancer survivors, I realize you must accept that you may die before you can do what’s necessary to go on living. Otherwise, you may freeze and not do everything you can to beat this or any other “terminal” illness. The mind has a tremendous capacity to heal. I believe the act of participating in getting well helps make that happen. I discovered I have to be my own primary care physician. You go to the doctors for their expertise, but they are fallible. I knew I need to make the final decision about what happens to me. I took charge of my own health and my treatment. That’s why I’m here today. Actually, you have a 5 percent chance of surviving. When we cut you open, it’s going to spread. You already have about forty tumours all over the area. If we don’t do the surgery now, you’re not going to make it. I didn’t die on the table, but I didn’t wake up from the surgery either. I was in a coma for two years. Doctors and nurses at San Diego Balboa Hospital kept me alive with feeding tubes, while treating the cancer with chemo, full-body radiation and hormones. While doctors were studying my case, they found fifty other women with my type of cancer. But most women had died because they didn’t know how to treat it. … I went to the gym…within six months I slimmed down to 180 pounds … by the end of it … my body weight was down to 165 pounds. Over the years, I made a name for myself. People thought it was a joke … I became the first woman to pull a 250-ton (500,000 pounds) train. Today I hold the title as the world’s Strongest Woman in my age group. It’s not a matter of how strong I am. I’m a normal, everyday woman. We’re all strong if we put our minds to it. I don’t wake up and fear dying; I don’t even think of dying. We’re all going to die. I know with Spirit guiding me, I’m strong enough to survive anything. If there’s a will, God always has the way. That’s what motivates me to keep going. Even when I’m in pain, I know it’s serving a purpose – usually it’s a reminder to slow down because I’m a very active person. How long I’m here, it’s up to Spirit. I think there is one reason why I’m doing so well: God does not want me yet. I began to vomit just driving to the office for the next chemo. The smell of the place made me nauseous. Everyone in the waiting room looked like I did – emaciated. There were times when I felt totally alone. Even my wife could not truly understand how I felt since I was the one with cancer. I didn’t understand why it happened to ME. Most days I doubted that I would ever survive. I remember a turning point … but it was not a pleasant one. I felt so utterly ill from treatments, I didn’t know if I wanted to live any longer. I was sitting on the toilet and vomiting into a bucket at the same time when I specifically asked God to either heal me or take me home. I had enough. My advice to anyone facing a grim cancer diagnosis is to please never give up. God didn’t create you to go through this life and its unexpected turns all alone. A word from Bernie Siegel, M.D. Self-induced healing is not an accident or a spontaneous lucky occurrence. It takes work, and the work is learning to love ourselves, our lives, and our bodies. When we do that, our bodies do the best they can to keep us alive. Remember life is uncertain, so do what makes you happy and eat dessert first. If all you do is share your story, you are doing a great deal. It is such a powerful testimony … its significance can’t be measured. Sharing your experience is almost always therapeutic for you, and the benefits to others are far-ranging … Knowing others have been down the same road is very powerful. People want to be inspired and hopeful. These are stories of exceptional people. We honour them. Science cannot explain why they survived their terminal cancer. Neither can science hope to duplicate or replicate these successes. Theirs are stories about the resilience and endurance of the human spirit. Success is more than just undergoing surgery, chemo or radiation. What strikes me most about these survivors is their desire and willingness to share – to give rather than to take all the time. This is indeed a rare human quality. How many of us appreciate that at times it is more blessed to give than to receive? At CA Care we receive many phone calls and emails every day. It is all people asking for help all the time. We choose to set up CA Care to help others, so we have no complaints. We understand our role – most of the time being a doormat. Let me share with some of my thinking about what cancer is all about. This entry was posted in Book & Research Report and tagged cancer, hope by CA Care. Bookmark the permalink.